We at Metropolia Business School wish to invite you to the inaugural event of our international business and politics speakers’ series on Friday, 28 January 2011, 13:30 at 1 Leiritie, Vantaa, in the A Auditorium. ﻿ ﻿Founded in 2010, as one of the first high-profile speaker series in the country, Helsinki Metropolia University of Applied Sciences Business School‘s Distinguished Speaker Series will bring a variety of high profile political, corporate, academic, and industry leaders to the business school. These speakers are at the top of their fields and share some valuable insights into the issues and strategies they are dealing with in the political and business world and furthermore how each affects the other during this age of globalization. This speaker’s series is but one facet of the university’s progressive public education mission. The series is open to all business school students, alumni, partners, friends, and guests. Our first speaker, Mikael Jungner was the managing director of YLE, which he left a short time ago and is now party secretary of the Social Democrat Party. He is a candidate for parliament this year. Mikael was extremely successful during his tenure at YLE and in most circles seen as a rising political force here in Finland. Here is a wonderful opportunity during an election year to listen to what he has to say about business and politics and how each affects the other and to question him on different issues that affect you. 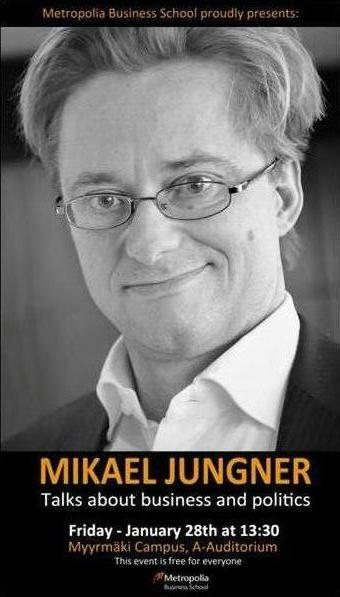 We at the university are pleased and honored to have Mikael Jungner open our series for us. The founder of Speakers Series is Donald Jordan our resident political expert. Let’s support Donald in his efforts to bring the brightest and best political and business speakers to Metropolia Business School.